In an exclusive interview, the head of the United Nations Development Program (UNDP) Achim Steiner tells DW why the international community must continue to help people in the Lake Chad region. A two-day meeting of donor countries started in Berlin on Monday, September 3rd, to decide on how to tackle the ongoing humanitarian crisis in Africa's Lake Chad region. Germany pledged an extra €100 million ($116 million) in emergency aid until 2020, on top of €40 million already earmarked to aid political stability in 2018 and 2019, German Foreign Minister Heiko Maas announced in the German capital. The crisis in northeast Nigeria and parts of Niger, Chad and Cameroon has led to an internal and cross-border displacement of 2.4 million people, destruction of livelihoods, disruption of local governance systems, human rights abuses, and disruption of health, education and other basic services. The crisis is the result of poverty exacerbated by drought and conflict in the region. UNDP Administrator Achim Steiner told DW that he sees an urgent need for further, sustained assistance. DW: How is the humanitarian situation in the Lake Chad region at the moment? Achim Steiner: It's serious. It's not quite as dramatic as a year ago in terms of the drought. And I think that the world often forgets that because the international community together with governments, particularly in northeast Nigeria intervened rapidly last year, we made sure that a period of drought did not turn into a famine. So that's a success. But right now in the Lake Chad region over 10 million people still need assistance. Partly because of the extreme weather conditions, but partly also because of the insecurity and the impact it has had on people in the region. Are donors still paying enough attention to the crisis? Are you getting the funds that you actually need to assist the people? The fate of the United Nations is that it often presents the world with what it would need and what countries in the international community need to do to actually help people adequately. Rarely do we receive those pledges. So no, the answer is we have not received enough funding. But on the other hand a significant amount of funding was committed in 2017 and 90 percent of that pledged funding was received, which is very positive news. And now we are here in Berlin for the high-level conference on the Lake Chad region and yet again the international community and the countries of the region are here with the United Nations looking at the next humanitarian response plan. And also, extremely important, a view on how to make investments in long-term development initiatives so that they actually tackle the root causes. If you don't have enough funding, what does that actually mean for the work of the humanitarian agencies on the ground? A terrible situation, analogous to a hospital where you have many victims needing help and you will have to make a triage and decide whom you are going to help. In practical terms it often means cutting food rations, shutting down schools in camps, simply not being able to reach people. Right now there are still a lot of people who we are not reaching. If we are not careful and funding does not come through for the next annual cycle, then it means essentially withdrawing our support, leaving people in an extremely difficult situation. We talk a lot about donors. But what are local governments and the local communities in the region doing to assist the people who have been hit by this crisis? First of all we must recognize that a number of the countries themselves have very limited means. They have constraints and therefore their ability to deal with extreme shocks is obviously severely constrained, financially and institutionally. 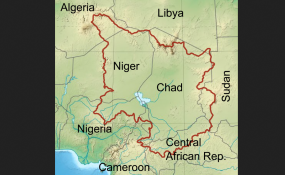 In some of the countries around the Lake Chad region part of the challenge is also that local government institutions are only supported at a very minimum level; that the resources that they have available to run even basic services, be it education, health or infrastructure services, are virtually absent. So their role is also critically important here at this conference in Berlin. We have governors present, we have the countries of the Lake Chad basin region present, at national and federal level, and so investments also by federal government budgets in each country are part of the equation. We are in a partnership here.